A critical part of our mission is to help create a community that is more inclusive, and accepting of autistic people and their families. 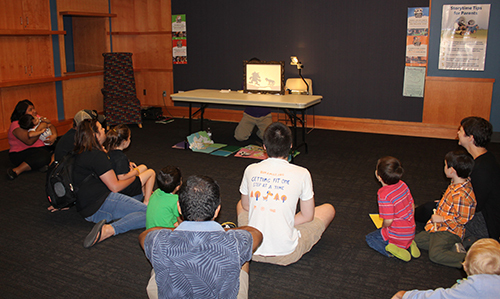 The Iowa City Autism Community (ICAC) has been pleased to work with local public libraries to assist in the creation of autism-friendly programming. Both the Iowa City Public Library (ICPL) and the North Liberty Community Library (NLCL) have opened their doors to autistic individuals and their families in order to allow them to feel free to be themselves, enjoy a calmer and quieter library and take part in activities designed with their interests in mind. The Antelope Lending Library also hosts a weekly Sensory Stop and provides autism-friendly children’s activities. These events have enjoyed visits from therapy dogs from One on One Therapy Dog Consulting as well as Therapy Dogs of Johnson County, and Marigold, the therapeutic miniature horse from Winds of Change Mini-Equine Therapy. Autism browsing hours often feature hands-on activities, sensory-friendly story times, lower lighting, and a more comfortable environment for visiting patrons. Families have truly enjoyed being able to explore their libraries together in this low-stress, welcoming environment. The Iowa City Public Library. Learn more about their library browsing hour here. The North Liberty Community Library. Accessible browsing hours are offered every other month and include free crafts, special story times and much more. Check the Iowa City Autism Community calendar for more information about activities taking place during these events. The Antelope Lending Library. This mobile library service is now offering a “sensory stop” every Wednesday from 8 am – 5 pm at 502 3rd Ave in Iowa City. Water tables, sensory activities and fine-free check out will be available to anyone. Learn more here.